Driving through the Spanish mountains on a beat-up motorcycle he bought after working at a German laundry for the summer, 17-year-old Travis Price arrived at the Alhambra blistered from the heat. For more than 40 years, the principal of Travis Price Architects has been called to do the same for others. Born in Georgia and raised in Panama and Germany, Travis’ family traveled often for the military, yet home was in the deep South. He loved watching Tarzan and building treehouses, and knew at 12 he was going to be an architect. Travis enrolled in architecture school, but was equally seduced by ‘the great books school’ he heard about while in Heidelberg. St. John’s had a sister campus in Santa Fe. Travis moved West for a semester, and stayed for five years. Largely, he was drawn to a group of ‘interesting characters’ at the University of New Mexico who were studying changes in architecture through the backdrop of Chaco Canyon. It was there that Travis had his first breakthrough in ecology and cultural design. Travis moved from Santa Fe to New York City, from one canyon to another, and spent the next five years working with self-help housing. He put the first solar collectors up in 1976 on the Lower East Side, and installed the first wind machine in Manhattan the following year—turning the meter backwards, and promptly getting sued by the utility company Con Ed. He won the lawsuit all the way to the New York State Supreme Court. The green story is a great one to tell, but Travis missed the purple, which he considers the color of culture. His practice and teaching are informed by human storytelling, filtered through his three design lenses of technology, ecology, and—most importantly—mythology. ‘Mythology is the culmination of the human story. All of our architecture begins with, ‘What’s the story?’ The Classical period did this well for its time. Now, not unlike Coltrane or Picasso or Gehry, we can shape buildings however we want. But the shaping of the shapers, and how that shape profoundly provokes an emotion, is really the higher ground for me. How to you get from a story to a poem, from a poem to a sculpture, from a sculpture to a piece of architecture?’ This is my passion and quest—modern architecture inspired by cultural literacy. A church, a synagogue, a mosque, or a Hindu stupa—each has a specific spiritual, sacred emotion it aims to evoke. Travis says those are easy rules to follow as an architect. But how do you do the same for the common home, and the common man? With clients, a bottle of wine helps, but Travis says the real way to achieve cultural literacy with each project is to simply ask questions—then listen for the story and watch for the glint of happiness in a client’s eye. Travis’ psychological approach has evolved. For a long time, he intuitively knew all the pieces were there, but struggled to articulate them within his practice. Then in 2000, he traveled to the Yukon and had an epiphany. Travis subscribes to a golden thread of the psyche; the notion of the one and the many. He can tune to it like a musician, but says he would never presume to name it. Clearly, Travis isn’t your average architect. 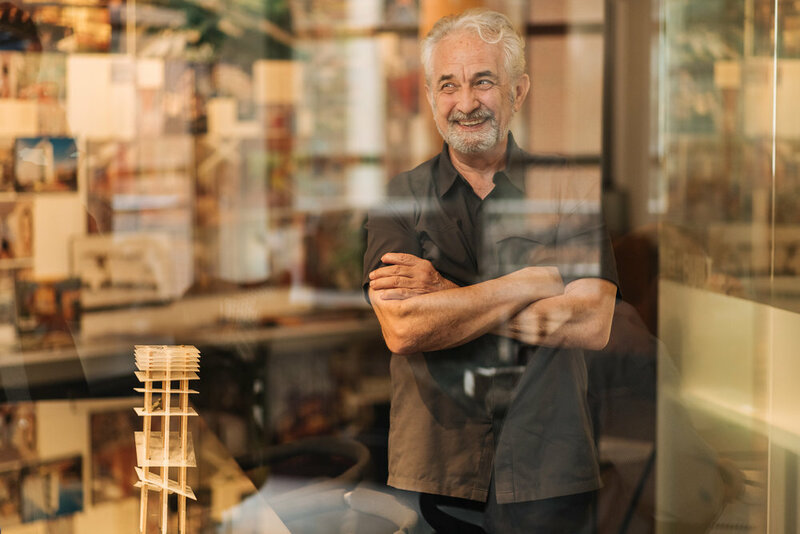 His fight against cultural homogenization has earned him dozens of AIA awards through a dedicated program in his practice, the Spirit of Place – Spirit of Design Build Expeditions. Georgetown serves as his muse in all of it.